These highlights do not include all the information needed to use AMOXICILLIN FOR ORAL SUSPENSION safely and effectively. See full prescribing information for AMOXICILLIN FOR ORAL SUSPENSION. 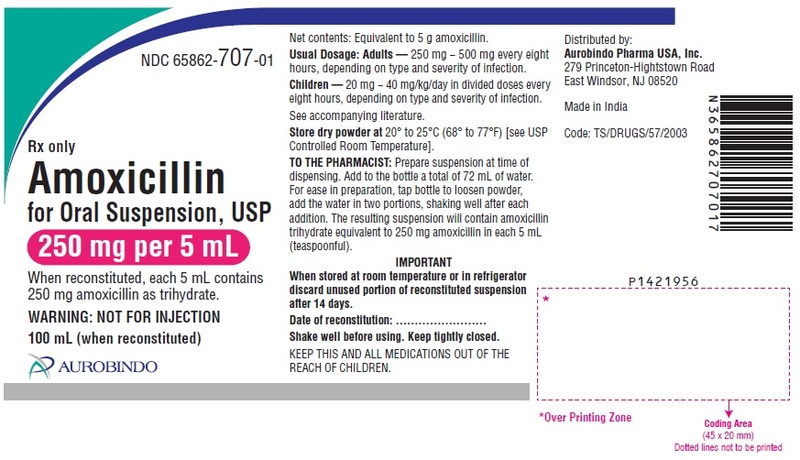 Amoxicillin for oral suspension is a penicillin-class antibacterial indicated for treatment of infections due to susceptible strains of designated microorganisms. Amoxicillin for oral suspension is indicated in the treatment of infections due to susceptible (ONLY β-lactamase–negative) isolates of Streptococcus species. (α- and β-hemolytic isolates only), Streptococcus pneumoniae, Staphylococcus spp., or Haemophilus influenzae. Amoxicillin for oral suspension is indicated in the treatment of infections due to susceptible (ONLY β-lactamase–negative) isolates of Escherichia coli, Proteus mirabilis, or Enterococcus faecalis. Amoxicillin for oral suspension is indicated in the treatment of infections due to susceptible (ONLY β-lactamase–negative) isolates of Streptococcus spp. (α- and β-hemolytic isolates only), Staphylococcus spp., or E. coli. Amoxicillin for oral suspension is indicated in the treatment of infections due to susceptible (ONLY β-lactamase–negative) isolates of Streptococcus spp. (α- and β-hemolytic isolates only), S. pneumoniae, Staphylococcus spp., or H. influenzae. Amoxicillin for oral suspension, in combination with clarithromycin plus lansoprazole as triple therapy, is indicated for the treatment of patients with H. pylori infection and duodenal ulcer disease (active or 1-year history of a duodenal ulcer) to eradicate H. pylori. Eradication of H. pylori has been shown to reduce the risk of duodenal ulcer recurrence. Dual therapy for H. pylori with lansoprazole: Amoxicillin for oral suspension, in combination with lansoprazole delayed-release capsules as dual therapy, is indicated for the treatment of patients with H. pylori infection and duodenal ulcer disease (active or 1-year history of a duodenal ulcer) who are either allergic or intolerant to clarithromycin or in whom resistance to clarithromycin is known or suspected. (See the clarithromycin package insert, MICROBIOLOGY.) Eradication of H. pylori has been shown to reduce the risk of duodenal ulcer recurrence. To reduce the development of drug-resistant bacteria and maintain the effectiveness of amoxicillin for oral suspension and other antibacterial drugs, amoxicillin for oral suspension should be used only to treat infections that are proven or strongly suspected to be caused by bacteria. When culture and susceptibility information are available, they should be considered in selecting or modifying antibacterial therapy. In the absence of such data, local epidemiology and susceptibility patterns may contribute to the empiric selection of therapy. Treatment should be continued for a minimum of 48 to 72 hours beyond the time that the patient becomes asymptomatic or evidence of bacterial eradication has been obtained. It is recommended that there be at least 10 days’ treatment for any infection caused by Streptococcus pyogenes to prevent the occurrence of acute rheumatic fever. In some infections, therapy may be required for several weeks. It may be necessary to continue clinical and/or bacteriological follow-up for several months after cessation of therapy. Powder for Oral Suspension: 125 mg/5 mL, and 250 mg/5 mL. Each 5 mL of reconstituted bubble-gum-flavored pink suspension contains 125 mg, and 250 mg amoxicillin as the trihydrate. Amoxicillin for oral suspension is contraindicated in patients who have experienced a serious hypersensitivity reaction (e.g., anaphylaxis or Stevens-Johnson syndrome) to amoxicillin for oral suspension or to other β-lactam antibiotics (e.g., penicillins and cephalosporins). Serious and occasionally fatal hypersensitivity (anaphylactic) reactions have been reported in patients on penicillin therapy including amoxicillin. Although anaphylaxis is more frequent following parenteral therapy, it has occurred in patients on oral penicillins. These reactions are more likely to occur in individuals with a history of penicillin hypersensitivity and/or a history of sensitivity to multiple allergens. There have been reports of individuals with a history of penicillin hypersensitivity who have experienced severe reactions when treated with cephalosporins. Before initiating therapy with amoxicillin, careful inquiry should be made regarding previous hypersensitivity reactions to penicillins, cephalosporins, or other allergens. If an allergic reaction occurs, amoxicillin should be discontinued and appropriate therapy instituted. Prescribing amoxicillin in the absence of a proven or strongly suspected bacterial infection is unlikely to provide benefit to the patient and increases the risk of the development of drug-resistant bacteria. Amoxicillin is primarily eliminated by the kidney and dosage adjustment is usually required in patients with severe renal impairment (GFR <30 mL/min). See Dosing in Renal Impairment (2.4) for specific recommendations in patients with renal impairment. The amoxicillin molecular formula is C16H19N3O5S●3H2O, and the molecular weight is 419.45. Each 5 mL of reconstituted suspension contains 125 mg or 250 mg amoxicillin as the trihydrate. Each 5 mL of the 125 mg and 250 mg reconstituted suspension contains 0.12 mEq (2.8 mg) of sodium; Inactive ingredients: art bubble gum flavor, colloidal silicon dioxide, edetate disodium, FD&C Red No. 3, silicon dioxide, sodium benzoate, sodium citrate, sucrose, and xanthan gum. Amoxicillin for Oral Suspension, USP: Each 5 mL of reconstituted bubble-gum-flavored pink suspension contains 125 mg or 250 mg amoxicillin as the trihydrate. Store dry powder at 20° to 25°C (68° to 77°F) [see USP Controlled Room Temperature]. Dispense in a tight container. 125 mg amoxicillin as trihydrate. 250 mg amoxicillin as trihydrate.